Linen woven from flax were used by lakeside dwellers in Switzerland in 9000 BC. They used it to cover themselves and keep themselves warm as they sleep. The first beds were used around 3400 BC after Egyptian pharaohs discovered the benefits of raising a pallet off the earth. Ancient Egyptians did not use pillows on their beds, but had a carved headboard shaped to allow their neck and head to rest on it to sleep. Several beds were found in the tomb of Tutankhamen including one that folded up for travelling and another of ebony and gold with a base of woven string to lie on. The Upper Class Romans owned beds decorated with gold, silver or bronze with mattresses stuffed with feathers, hay, reeds or wool. They also had waterbeds. In the East in Bible times the bed was not a piece of furniture but a mat. Whole families slept on a single mat together. In the morning the mat was rolled up so that it did not take up so much space. People could, and did, quite easily take their "beds" around with them. Hence Jesus said to a man he had just healed: "Get up, take your mat and go home"
In 1495 The English Parliament passed a statute regulating the content of bed stuffing, requiring that it be good, clean feathers, not dirty old horse hair. In the 1500s there was nothing to stop things from falling into the house. 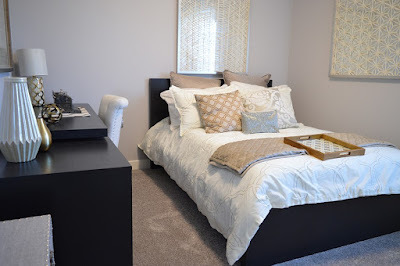 This posed a real problem in the bedroom where bugs and other droppings could mess up your nice clean bed. Hence, a bed with big posts and a sheet hung over the top afforded some protection. That's how canopy beds came into existence. 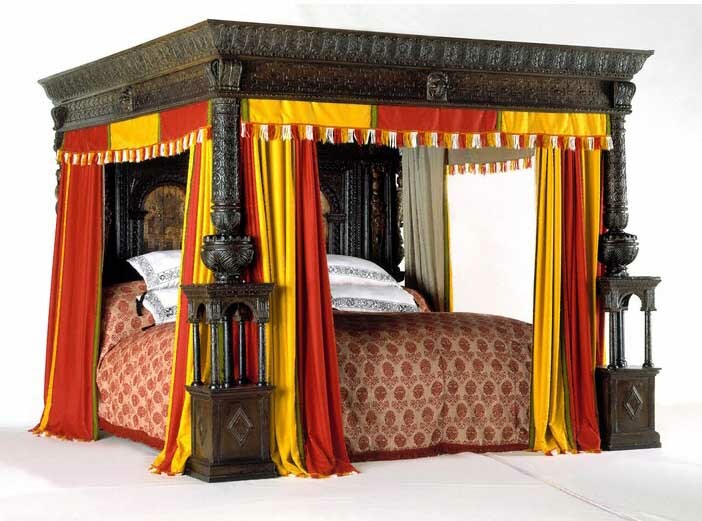 Britain’s largest bed, the Great Bed of Ware was built in 1596. It can accommodate 12 people. Mattresses in Shakespeare’s time were filled with straw and held up with a rope stretched across the bed frame. If the rope was tight, sleep was comfortable. Hence the phrase, "sleep tight." ‘Bed’ is an Old English word but ‘bedroom’ arrived only in 1600. William Shakespeare's will, still in existence, bequeathed most of his property to Susanna and her daughter. He left small mementos to friends. He mentioned his wife only once, leaving her his "second best bed" with its furnishings. King Louis XIV(1638-1715) of France’s rising in the morning and going to bed at night were attended by elaborate ceremonies called the "levee & couchee." Each noblemen had his own duty & part to play in these rituals. Louis collected beds, he owned 414 in total. All were elaborately carved, gilded and hung with costly embroideries. His great joy was the magnificent bed in the Palace of Versailles, on which were woven in gold the words "The Triumph of Venus". But when Louis married his religious second wife she had the pagan subject replaced by "The Sacrifice of Abraham." Cast-iron beds and cotton mattresses were introduced in the middle of the 18th century. Thomas Jefferson had 13 bedrooms at his Monticello home. All the beds were simply mattress supports hung on wall hooks. The waterbed was invented in 1833 by the Scottish physician Neil Arnott. He intentionally did not patent it so that anyone could design their own variation of the waterbed and it could help as many people as it could who were suffering from bed sores. In order to overcome insomnia Charles Dickens pointed the head of his bed north because of his belief in the powers of magnetic flow. Mattresses with coiled springs inside were invented in 1865. After near-fatal aircraft crash on July 7, 1946, Howard Hughes decided he did not like the design of the hospital bed he was laying in. He called in his engineers and had them design a new bed that would allow someone with severe burns to move freely. It became the prototype for the modern hospital bed. In 1964 the first Habitat store opened in the UK. They were one of the first British stores to sell duvets and shoppers were so intrigued they would climb into the beds in the store to try them. The world’s largest bed was made in the Netherlands in 2011. It was 86ft 11in long and 53ft 11in wide. The world's most expensive bed is the Baldacchino Supreme - $6.3 million, with over 200 lbs of 24k gold and fine Italian silk fabric. Kevin Wheatcroft, a British businessman and motor sport entrepreneur, is the owner of the world's largest collection of Nazi memorabilia. He sleeps in a bed once owned by Hitler, but has "changed the mattress"
Studies suggest that unmade beds are healthier for us than neat and made beds - Bed bugs have a harder time surviving in messy beds. In a year, the average person walks four miles making his or her bed. One out of every two million people will die by falling out of bed. Clinophobia is the fear of beds. Clinomania is the excessive desire to stay in bed. Dysania is the technical term for finding it difficult to get out of bed in the morning. © Copyright 2011 - 2019 Encyclopedia Of Trivia. All Rights Reserved.. Simple theme. Powered by Blogger.